Santa rides in a sleigh. JESUS rides on the wind and walks on water. Santa comes once a year. JESUS is an ever-present help. Santa comes uninvited down your chimney. JESUS stands at the door of your heart and knocks ... and will enter if you invite Him. You have to stand in line to see Santa. JESUS is as close as a call on His name. Santa has to ask you your name. Jesus knew you before He created the world. Jesus knows your address, your history, and your future. Jesus knows the number of hairs on your head. JESUS has a heart full of love. JESUS offers health, help and hope. Santa says, "You better not cry". JESUS says "Cast all your burdens and cares on me because I care for you. JESUS gives new life, mends wounded hearts, and repairs broken homes. Santa might make you chuckle but … JESUS gives you joy and strength. Santa puts gifts under a tree … JESUS became our gift and died on a tree. Santa was at one time known as Saint Nicholas. Jesus WAS, and IS, and IS to come. 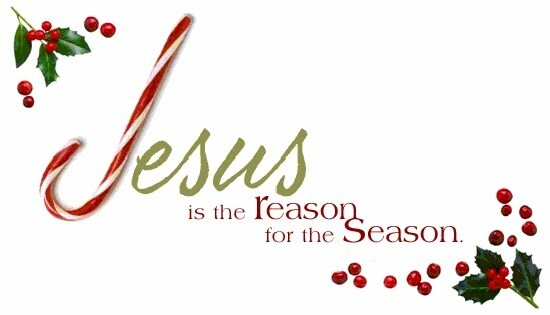 Jesus is still the reason for the season.May the Lord bless and watch over you and your loved ones this Christmas. May He guard you with His powerful arms. May He lift your tired spirit. May He soak you with His love and provision. And may you return your focus to Him in all things.